Most people believe they don’t need any of the best Android task managers mentioned below when dealing with errant apps. But, the truth is that these ones can come in pretty handy to stop applications from hogging all the battery. Besides, they allow you to clean cache memory and determine which program should run at all times. If you are not very sure about using these app killers, have a look at our list and then decide whether you need them. Advanced Task Manager acts as a task killer for your phone and even helps you save up on your battery life to keep the phone going for a little longer. Its ability to clear up the phone memory and stop unwanted apps naturally results in a relatively fast performance. This app gives you the option to select programs that you want to kill, or to ignore those which you do not want to stop. Moreover, you can even schedule clean ups and directly uninstall applications. It also keeps you in the loop about your battery life so you can close programs accordingly. This contender on our list of Android task managers takes up not more than 160KB of space on your phone, so it definitely won’t hurt to have it installed on your mobile device. Similar to most of its counterparts, it lets you monitor your apps and kill them to keep the battery use in check. It even prevents your phone from lagging when carrying out demanding tasks. This software tags along a widget that instantly lets you view the memory status. You can even consider ES Task Manager to ensure that you do not run out of battery because of unwanted apps running in the background. You can easily kill applications and ignore those which you do not want to be stopped. In addition to smoothening things up by clearing your cache memory you can also uninstalling applications using the tool. It seamlessly integrates with ES File Explorer too. This multitasking app on our lineup of Android task managers can carry out various operations including managing applications and monitoring systems. 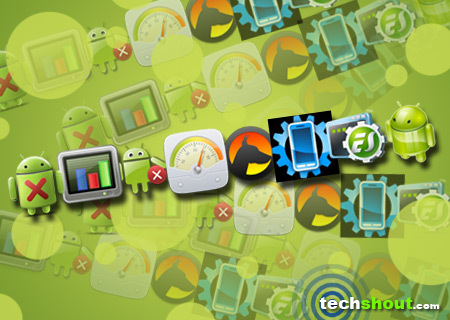 Its background monitoring service keeps a log of the CPU usage of each app in order to conserve battery. This negates the need to plug your phone into a wall socket time and again. It lets you have a look at all applications running and the amount of memory they are eating up, so you can choose which ones to kill. Another alternative in this category is the Free Advanced Task Manager, a light application that can end apps, allowing the phone to cough up the juice for an extended period of time. It even makes the handset swift, so you can bid goodbye to sluggish performances. Compatible with tablets, this tool keeps you informed about the battery, memory and device details. It also offers charts and visuals to indicate system information. The App Detail Page is meant to let you terminate apps, while shortcuts are for instant access to useful functions. And if that’s not enough, it lets you take advantage of the SD card management feature as well, but only if you are using Android v2.2 or higher. The Android Task Manager pretty much works with all the Android platforms, including the latest Jelly Bean. This overall system manager keeps tabs on your tasks, apps, SD card and the device in general and generates process lists in real time. It claims to understand various commands and lets you multi-select software, kill apps automatically and even shake the device to end tasks that are running unnecessarily. It also permits you to create backup folders of applications on your SD card and restore them when needed. Needless to say, this tool comes with a homescreen widget and provides information about CPU and memory usages. Taking our queue of Android task managers a bit further is Watchdog Task Manager, which urges you to watch your apps instead of killing them. The tool prevents apps from eating up your CPU as it keeps you warned about such software and prompts you to end just the one that proves a nuisance. The pro version of Watchdog permits you to assign a CPU percentage threshold to a particular app which is then killed automatically if it crosses the limit. In addition to usual functions like killing tasks, saving battery and causing your phone to run faster, Go TaskManager EX comes with ‘Phone examination’ to check statuses of high risks apps, installation packages and more. It clears the cache memory for you and monitors all the auto launching applications which tend to affect launching speed. It even ensures that the APK files of apps already installed are deleted so they don’t take up all the free space on your phone. 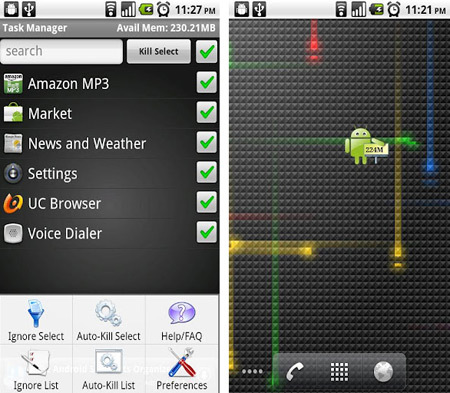 The ones listed among our best Android task manager apps are definitely more than mere tools meant for killing applications. While you may already have some demanding and essential apps in your phone, the last thing you would want is an app eating up your battery pointlessly. This brings us to the question: ‘who’s to monitor the monitors?’ Share your thoughts in a comment.